There is nothing better than the taste of a good cut of meat cured with smoke. 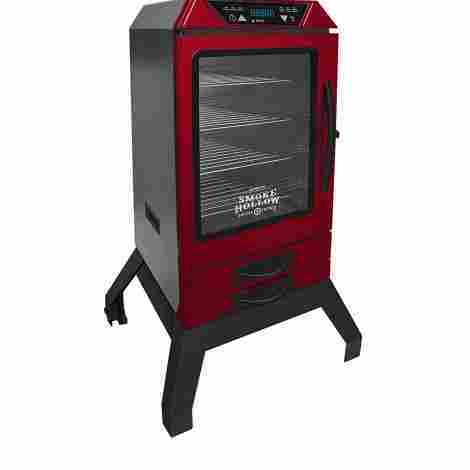 Whether you’re cooking up jerky, or just getting some veggies ready, you need a machine that can get it done. A lot of people want to get into smoking their own food but aren’t really sure how to start. It’s a crazy world out there and there’s a lot of information on the subject to take in! Luckily, we’re going to go over some of the best products on the market. You’ll be able to see which ones are best, why we think so, and decide for yourself which is perfect for you. Oh, and did we mention these guys run on electricity? That means that you can use them safely almost anywhere. They’re always ready when you are, and won’t ever let you down. Smoking is an art form and can result in some seriously mouth-watering food. However, it’s important to make sure you’re using a tried and true smoker that won’t screw up your meal. Ever had a long-awaited meal that took forever to cook come out terribly? Yeah, it isn’t fun. So, instead of playing games with your dinner, invest in one of these products below! Don’t like what you see? No problem. We’re sure you’ll find what you’re looking, but on the off chance that you don’t we’ll also go over our criteria, how to select your own and some frequently asked questions. Dyna-Glo really outdid themselves with this digital model. 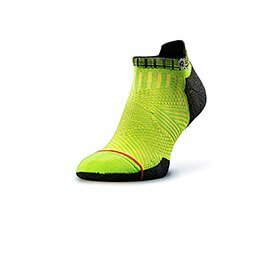 It offers an incredible amount of features, all of which is going to knock your socks off. There are also three different models to choose from, ranging widely in price. This allows you to find the perfect fit for your needs and your budget. Dyna-Glo is a great brand that has trusted products we can stand behind. This Bluetooth-enabled model is no exception. We were absolutely blown away by the sheer brilliance of the design, and the add-ons included. This bad boy is Bluetooth enabled. No joke! You download an app to your phone that lets you maintain full control over the cooking process. This is so incredibly convenient and allows you to kick back and relax while you wait. Plus, it’s super fancy! Show off to all of your friends, and they’ll surely ask all night where you got your hands on this fantastic find. And then, of course, you can direct them to us! We promise we’ll take good care of them. You’ll never have to worry about checking on your meat manually ever again. There is an integrated meat thermometer built right into the cooking space. This means that it can tell you in realtime what temperature your protein is cooking it, and when it’s a good time to take it out. Opening a smoker to check can screw up the cooking process entirely. With this model, you can skip all of that! You will not find a better value than this. While the price tag can get hefty, we think it’s a model worth every penny. 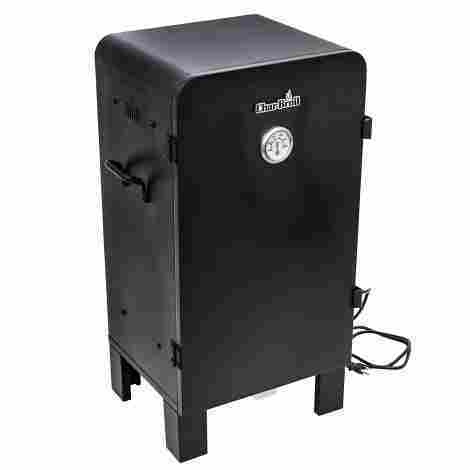 There is no better time to invest in a grade-A smoker, and this one is definitely an investment worth making. Whether it’s the Bluetooth you love or the craftsmanship in the design, you can’t go wrong with Dyna-Glo. Now, that being said, we understand that this won’t fit everybody’s budget. Have no fear! We have plenty of more affordable, but just as fantastic, models lined up further down the list. Need a super-authentic taste from a digital model? Z Grills is here, and they are absolutely delivering. We love this traditionally designed masterpiece, and everything it stands for. Why not cook great meat… and look just as great doing it? Besides the craftsmanship, the Z Grills model comes with a full range of fantastic features that’ll keep you coming back for more. Let’s talk about some of our favorite features, and where this product lands on the value scale!. It’s no surprise that we love a product that functions well… but we love that product, even more, when it looks great, too. After all, there is something to be said about a great design. Z Grills offers this and so much more in their twist on a traditional meat-smoker. It comes in a sleek, shiny black with rugged detailing that fits any aesthetic. No matter how your backyard is decorated, this will fit right in. Hear us out. We know this may not seem like a big deal, but it totally is. Think about it this way: If a company offers a lifetime guarantee, they probably really believe in their products. They know that they will absolutely be replacing that model since eventually everything breaks. But they also know that their model is going to last so incredibly long that it’ll be a while before you cash in on it. It’s like the ultimate satisfaction guarantee. 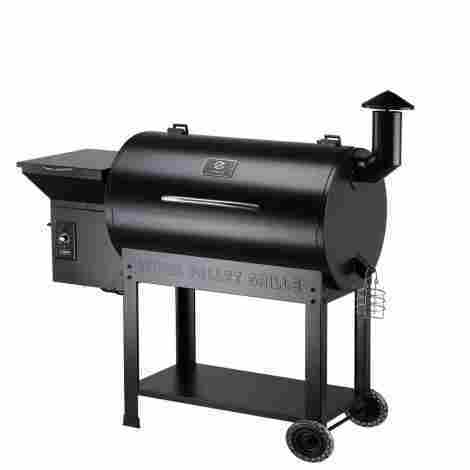 The Z Grills smoker is an excellent product. It may not have as many bells and whistles as our number one product, but it really packs a punch. It was a very close second! It has a huge capacity, smart-smoke technology, and looks amazing! On top of this, Z Grills backs their product one-hundred percent of the way. You won’t find the same quality in many other models, so this one by Z Grills is sure to please even the fussiest palate. We can’t lie! We’re loving the name of this company. Smokehouse put out the Big Chief with their customers in mind, and it shows. There is nothing “little” about this model or the number of amazing features that it displays. You’ll love the space it offers, the taste of the meat, and the quality of craftsmanship. We know that we do! Keep reading to find out more on this miraculous, little machine. If you aren’t sure what kind of flavor you want, don’t worry! Smokehouse has you covered. They include a 1.75lb bag of hickory flavor wood fuel. This will allow you to taste-test one style while you figure out what else you want to try. Hickory is a huge fan-favorite, and a lot of people use it as their go-to flavor. Who knows, maybe it’ll end up being your favorite! You should be proud enough of your belongings to display them loud and proud. This model is made with a shiny, high-quality aluminum that’ll shine brightly on the cloudiest days. It also features a fancy logo embossed right into the door. This tells everybody where you put your money, and what a good product you’ve managed to score! We love the cost, we love the company, and we love the style! This is a great combo that you’re going to love oh-so-much. There are almost no reasons not to invest in this Big Chief front-loader. Honestly, we really had to reach to find any cons at all. There aren’t many! The price really is right for what it offers. It may not offer anything too fancy, but you aren’t paying the extra price to get those features. Smokehouse has a lot to offer, and you should definitely strongly consider this model! We can’t lie! We’re loving the name of this company. Smokehouse put out the Big Chief with their customers in mind, and it shows. There is nothing “little” about this model, or the amount of amazing features that it displays. You’ll love the space it offers, the taste of the meat, and the quality of craftsmanship. We know that we do! Keep reading to find out more on this miraculous, little machine. You should be proud enough of your belongings to display them loud and proud. This model is made with a shiny, high-quality aluminum that’ll shine bright on the cloudiest days. It also features a fancy logo embossed right into the door. This tells everybody where you put your money, and what a good product you’ve managed to score! We love the cost, we love the company, and we love the style! This is a great combo that you’re going to love oh-so much. There are almost no reasons not to invest in this Big Chief front-loader. Honestly, we really had to reach to find any cons at all. There aren’t many! The price really is right for what it offers. It may not offer anything too fancy, but you aren’t paying the extra price to get those features. 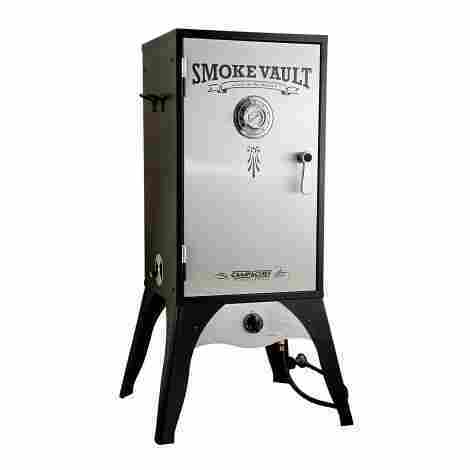 Smokehouse has a lot to offer, and you should definitely strongly consider this model! This is a name synonymous with high-quality products that can be trusted across the board. We frequently feature their products on our guides, and there’s a reason for that! Their craftsmanship is next to (almost) none, and the care they put into their designs can be felt just by looking at this model. The Char-broil Analog model is a beautiful piece of machinery that allows real-time checks on your food without compromising flavor or heat. Read more about it below! Never again worry about your seal not being up to par. After all, that leads to both temperature and precious smoke escaping. What a way to ruin your day, right? Char-Broil included dual latches to make sure that door stays securely shut so you can worry less about quality and more about the massive quantities! On top of this they also mounted a temperature gauge on the door. What a great bonus! This is another mid-range product that doesn’t cost nearly as much as you think it would. Even though it looks like a bank vault, you won’t have to worry about dropping your life savings into it! We highly recommend this as a starter model if you’re looking to venture into this wonderful world of made-to-taste meats. Of course, the connoisseur will also find something to love about this model. It’s really just a great product for people all around! Watch every move your meat makes! Of course, we don’t think it will be making many “moves”, but you get the idea. Masterbuilt put a window into the front of this so you can easily keep an eye on anything you’re smoking up. This is a great feature that we really think adds a lot of value to the product. Burning, or overcooking in general, can ruin an entire barbeque. Don’t fall victim to a guessing game! With Masterbuilt, you get the sure bet. Wow-ie, folks! Now this is an interior we can all get behind, and fit into… Okay, that’s an exaggeration. We can’t all fit into it, and quite frankly we don’t think you should try. But you can most likely fit almost en entire cow in there! Now, that’s something you actually should try. Masterbuilt offers 721sq. In. of cooking space, which means you’ll never run out of room ever again. The interior is spacious, and ready for whatever you throw at it. Honestly, we winced a little when looking at the price tag. This is the biggest reason why the Masterbuilt Digital model ranks so low on the list. It has a lot of great qualities, and offers a lot of perks. However, when it comes to cost, you really have to be willing to invest to get it. This is better suited as a gift to a loved one you really want to impress (say, your father-in-law that you aren’t sure has ever even liked you). Or, perhaps you want to treat yourself. Either way, if you’re looking for a splurge, this is a worthy object to do just that. There’s something simply soothing about this brand. Maybe it’s because the name reminds of us an old, eccentric uncle that makes moonshine in his spare time and always carries a banjo for merriment on the go. Oddly specific, but you understand what we’re getting at. You know that uncle has some absolutely stellar recipes for smoking meat, too. He sounds like just the guy we trust to get some good, ol’ barbeque going for a fun night of partying, drinking, and eating. As it turns out, that’s exactly what the Old Smokey model offers. Juices drip right back down on the meat because of this innovative design. 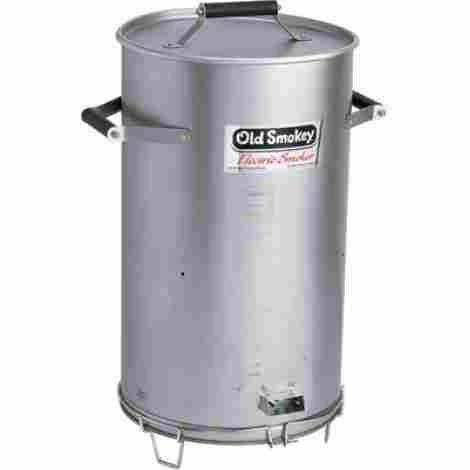 While most of the products are shaped like boxes, Old Smokey uses a round, cylinder shape that loads from the top. While top-loading can be a hassle, it really does make a difference in taste. Any juices that escape from the meat and evaporate off while condensing on that cover and then fall back down to make your meat extra flavorful. You’ll have precision control over exactly how much heat is being used with Old Smokey. 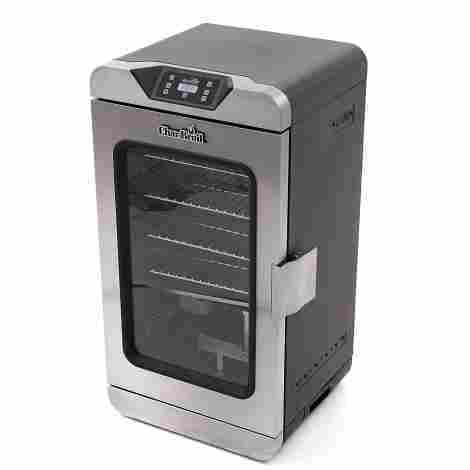 They include a heat thermostat which controls the smoker as a whole. This thermostat delivers exactly the heat needed to get the job done and ensures an even temperature across the board. Overcooking is a thing of the past when you have Old Smokey on your side! Old Smokey corners the market in affordable, but high-quality, products. This model rings in at a much lower price than many other smokers on the list. While it’s a slightly unconventional build, we really think that is has something to offer the other products can’t. Old Smokey definitely isn’t for everybody, and most people may prefer a front-loading version. However, if you want to take a step outside of your comfort zone and try something new, Old Smokey made this for you! This fantastic option from Smoke Hollow features a whopping 1035 square inches of cooking space, perfect for the chef who wants to take care of a lot of meat at one time. 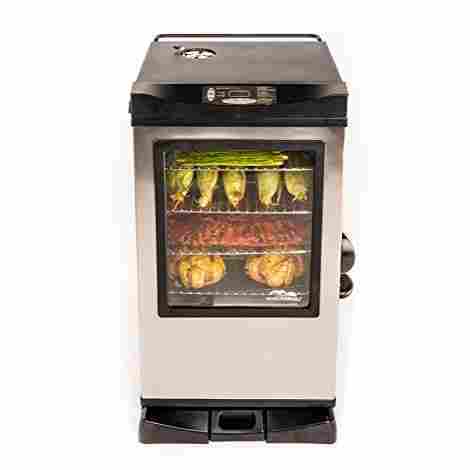 It also offers three different types of smoking options: cold smoke, hot smoke or fast smoke, which will allow you to cook your meat in a different way to achieve different, but delicious, flavors. This is another model that is Bluetooth enabled. You don’t get much cooler than that! The world is constantly evolving, and while it does this we move towards more and more technology-friendly products. The Smoke Hollow model is no exception. They have listened to the needs of their consumers, and delivered a product that meets all expectation. You’ll truly love how effortless the Bluetooth technology makes your next cook-out! Smoke Hollow includes a heavy-duty stand with this model. The stand features wheels which makes moving this machine around a snap! You’ll truly appreciate the mobility when it’s time to put your smoker away and clear up some room for festivities, or just a day of lounging about. It also makes it a great model for camping, or smoking on-the-go. Tailgate? No problem. Steal the show, and attract a crowd, by bringing your smoker with you. This is another model that is on the high-end as far as price goes. We really can’t stress enough that you do get what you pay for. However, for those who are more savvy when it comes to saving money, this is not a good model for you. We love the look of it, and how fancy we feel while operating the Smoke Hollow model. We also love the bluetooth, and other features packed into this fiery package. But, at the end of the day, only you know if it’s worth it. 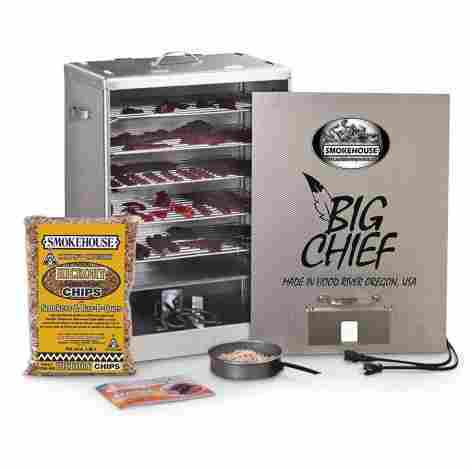 Vault yourself into smoking success with this excellent addition to the Camp Chef line! Camp Chef goes the extra mile to make sure you’re able to smoke in both class and style. Their effortless designs are clearly crafted with both care and ingenuity. You’ll savor every moment of the smoking process, and be salivating for more. Making jerky has never been so easy, or so much fun. You’ll feel like a kid at summer camp! Like we said, this is really a sight to behold. The entire design is gorgeous, and Camp Chef really put a lot of thought into it. The name of the model is the “Smoke Vault” and they kept this theme through the entire crafting process. They took that idea and absolutely went for it! And y’know what? It works for them. We can totally appreciate a thoroughly branded design, and that’s exactly what Camp Chef is offering. Feeling a little worn out when it comes to your cooking? Camp Chef has you covered. They include some great recipes with this product that’ll give you fresh ideas for your next batch of meat. Don’t worry about not being a “master chef” yet! The Smoke Vault is going to help you on your way to being the very best, regardless of where you are now. Even a newcomer will be able to rock the boat, and bust out the best smoked meat around! As far as price goes this is a fairly mid-range product. It’s certainly not even close to the most expensive on the list, but it’s also definitely not the cheapest. This makes it a great choice for beginners who are a little more advanced in the art of outdoor cooking. It’s really a good choice all around, however. 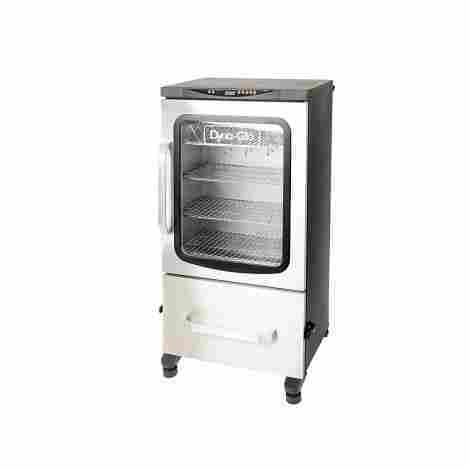 The sleek design, included booklet, and quality build make the Camp Chef Smoke Vault a great choice at a great price point. We’re going to round off the list with another Char-Broil model! We can’t say enough about how good this brand is, and how much we love it. That’s why we want to add another product by them! After all, you always want to end these things on a high note. While it may not be as fancy, or as well designed, as other units on the list, it’s still a great buy. After all, we only select the best of the best! Remember: even the #10 product on our lists are going to be stellar additions to any collection. There’s nothing better than a bright, LED display that leaves no room for guessing games. We especially love this since it adds a layer of accessibility. Anybody with vision impairments will have a much easier time operating the Char-Broil Deluxe model. The display is blue, which is definitely a nice touch when contrasted with the dual-tone colors this model is built with. Don’t let a single wisp of smoke escape from your cooking meat! All of that smoke counts, and you can’t have any of it seeping out into the open air or, worse yet, letting the open air get into your smoker. The smoke-tight seal will give you peace of mind knowing that you don’t have to worry about the quality of your meat at all. Give yourself that peace of mind, and order your Char-Broil Deluxe today! We rate this as a good buy, but definitely not the best. We like the price-tag, but it does make us a little weary. The reviews are less than stellar, although there are a bunch of very happy customers. All in all, we love the Char-Broil Deluxe and everything the brand stands for. However, you may be better off looking towards products featured a little higher up on our list. Don’t be deterred if you really love this model! It’s a great purchase for sure. There you have it! The best, dang products on the market to get the perfect brisket each and every time. Do you want perfect jerky? We got you. Each and every product we selected was put under a bright light and inspected thoroughly. We looked at reviews, specs, and more in order to determine what was best, and what was even better than the best. However, we also understand that we can’t please everybody. Doing so is nearly impossible! So, in an effort to actually do that very same impossible thing, we have another section below. Keep reading to find out how we selected these products and some questions that a few people have raised. If you’re smokin’ up a big batch then you’re gonna need the space to cook it in! Most people smoke meat in large quantities. Whether this is for Christmas gifts (who doesn’t love homemade jerky!? ), a family gathering, a company outing, or anything else, it’s a common practice. It’s fairly clear why you want a lot of storage space! Number of racks: The number of racks included is super important. This gives you not only extra space to smoke food on, but it also allows you to make more use of the vertical space. Keeping things organized is a huge part of cooking! Sausage hooks: Some models come with sausage hooks. This is super useful for keeping them out of the main smoking area, since that should be taken up by cuts of beef and pork. This isn’t a feature found in many models, so if you see it you should put it near the top of your list! Total Capacity: How many pounds can the smoker hold? That’s a great question to ask yourself when you look into buying one of these electrically powered models. Most manufacturers will tell you exactly how many pounds you can smoke at once. Although this comes down to personal preference, there is something to be said about each. Front loaders tend to be easier to use, and also allow for you to watch your meat as it’s smoking (provided there’s a window). Top loaders are a more traditional style, but they don’t allow you to view what’s going on.inside while your food is being smoked to perfection. We only included one top-loader for this reason. Although it is a more traditional model, it’s definitely less effective. You need a weather-proofed model that’s going to, well, weather the weather. You don’t want it rusting on you, or shorting out. Strong metals are also important since softer ones will dent if you aren’t careful. Look for steel, and try to stay away from aluminum. Although aluminum is just fine as a choice, treated steel tends to be a little more durable on the whole. Finally, we looked at some cool features that are unique to each model. You won’t find these everywhere, but it pays to keep an eye out. This is why the products on our buying guide are so much better than the others on the market! We make sure to find the coolest models that go the extra mile in trying to impress. Window: Having to open up your smoker to see what’s going on can let both heat and precious flavor escape. This is why a lot of companies are starting to include a window for easy viewing. This allows you to keep an eye on the prize without ruining it. Technology: Did you know that some of these come with Bluetooth?! It seems crazy, but it’s true. Technology has brought us so far and it continues to amaze us with its applications. Extra tech allows for easier and more precise control. That’s exactly what you need to smoke up the perfect cut! 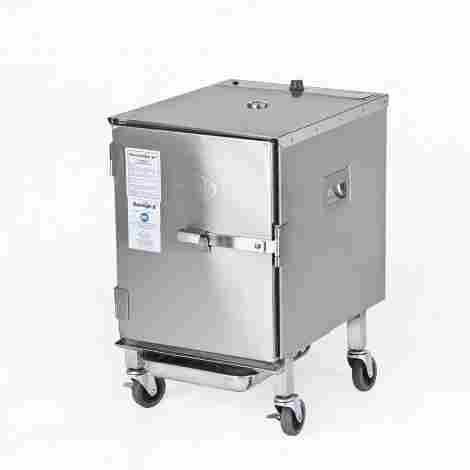 Mobility: At some point or another you’re probably going to want to take your smoker with you somewhere. Camping, for example, would be a great place to put it to use! Leave your meat smoking all day while you hit the beach, sit around the fire, and knock back a few cold ones. At the end of the day when everybody is feeling good and buzzed you’ll have a delicious meal to fill your stomachs before hitting the hay. Internal temperature gauges: Again, you never want to open a smoker while it’s smoking. The flavor of your meat is determined by how much smoke is able to soak into the bark. Most models come with an internal gauge so you can determine the temperature without disturbing the process. If it doesn’t, it better have some stellar features to make up for it! Recipe Booklets: Sometimes you’ll find a model that comes with a recipe booklet. Some companies add this in as a nice gesture to get you started. Although it doesn’t rank super high on the “necessity” list, it’s certainly a nice touch. Q: Can I buy a temperature gauge if it doesn’t come with one? A: Absolutely. We definitely recommend this if the smoker of your choice doesn’t come with one already inside of it. Q: Where can I find great recipes? A: Basically anywhere online! As mentioned above, some companies might also include their own recipes with the model itself. We plan on doing an article on just that in the future, so be sure to stay tuned! Q: How safe are these? A: As far as outdoor cooking goes these are fairly safe. Because they lack an open flame and are electrically powered you don’t have to worry about anything catching fire accidentally. Electricity provides its own problems, but generally speaking, it presents less of an issue as fire. Q: Can I use them indoors? A: We do not recommend that you do this. Like, at all. It’s a terrible idea and can have some pretty big consequences. Aside from smoke inhalation, which can occur fairly easily, you might also put yourself at risk for a house fire. Although they are safer than open-flame options they are still not safe for indoor usage. Q: What can I cook in my new smoker? There are many more, but these are some of the most popular options around!